In this video we will discuss about adding custom event to the asp.net composite custom calendar control that we have been working with from Parts 112 to 115. 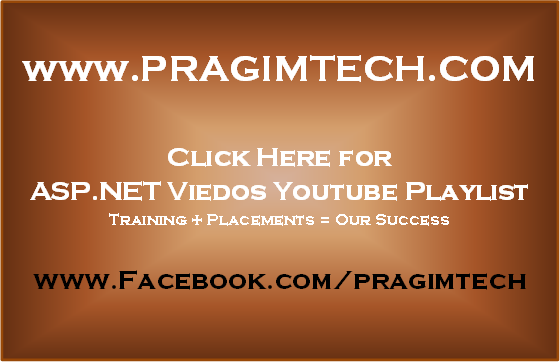 Please watch Parts 112 to 115 from the asp.net video tutorial before proceeding with this video. We have discussed about adding custom events to user controls in Parts 106 to 108. You can watch these videos from the asp.net video tutorial. Adding custom events to a composite control is similar to adding events to user controls. Step 3: Create "DateSelected" event. Step 4: Create a protected virtual method to raise the event. Step 5: Finally raise the event, when the date selection in the calendar changes. Build the CustomControls project. In an asp.net web application add a reference to the CustomCalendar control. Drag and drop the CustomCalendar control on a webform. Right click on the control and select properties. In the properties window, click on the events icon. Notice that, the event "DateSelected" is displayed. Double click on the "DateSelected" event. This should automatically generate an event handler method. Implement the event handler method as shown below. Please run the project, and test.